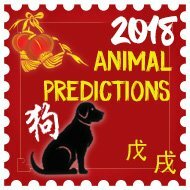 From 5th May 2018 to 4th June 2018 is the fourth month Ding Si (Yin Fire Snake) of the Wu Xu year (Yang Earth Dog) with the ruling energy of #2 in the central grid. Tui 7 Red (Po Jun) robbery star is a metal star and a yin trigram and known as the mischievous Po Jun #7 argumentative red star is a negative influence in Period 8. 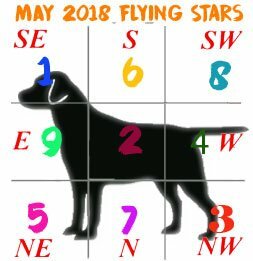 In May 2018, we have the #7 star fly in to the north which also has the negative #5 annual star which means that care is needed in the north this month. This is a fighting star which can cause problems if left alone, the #7 Red indicates a high risk of burglary, deception, copyright theft, gossip and back stabbing this month. – You can leave your metal cures in place in the north this month. The 5 Yellow (Lian Zhen) star of tragedy has fallen in to the northeast in May 2018 along with the annual #3 star. It affects the overall luck, virtually all types of illness including many mind related problems with regards to thought process, lack of energy and procrastination. 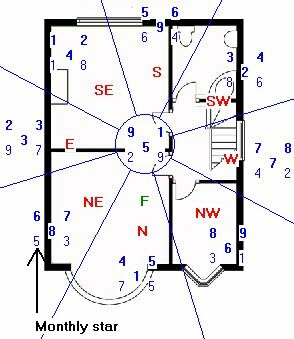 It will not affect anyone in particular in the home as the #5 star does not have a trigram and no yin or yang energy so to speak and this is why the negative aspects of this star are so strong. Stillness together with metal cures can keep its negative influences at bay and you must avoid using fire energy like reds and candles in this area this month; if you already have your annual cures in place, you can leave them as they are in May. Li 9 Purple (You Bi) Li 9 Purple is a fire star and a yin trigram and considered a star of future wealth and has an auspicious influence in Period 8. Unfortunately, this auspicious star has fallen in to the east where we have the inauspicious #7 star. 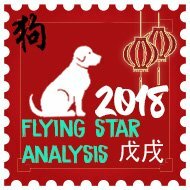 Career opportunities and promotions are probable especially if you have an office or main door in this area this month although you will need to have you annual flying stars in order to make the most of this area. There is fame and acknowledgement, growth and improvement. It affects the eyes, mental disturbance, blood disorders and stomach and can cause problems at work. These problems only occur when you have poison arrows directed to this area this month. Couples with a bedroom in this location can also enjoy good relationships provided this area is kept quiet during May. There may also be a chance of producing intelligent children. If you want to enhance this further place a statue of Kwan Yin in this part of your bedroom. Ch’ien 6 White The star of Heaven star (Wu Qu) is a compassionate money star and a yang Trigram and it affects the lungs, large intestines and head and can impact the Patriarch (eldest male) although on the whole it is considered an auspicious star and in May 2018, it has flown in to the south along with the annual #4. The Ch’ien metal 6 is a conditional star and is auspicious in Period 8 (2004 – 2024). It governs wealth, leadership, success and ambition and is very good for politicians, leaders and anyone involved in the jewellery business. Those with a main door, office/study in this area will benefit greatly this month. 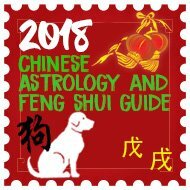 Ken 8 White Zuo Fu is an earth star and a yang Trigram and is the most auspicious governing flying star of the lower era of the sexagenarian cycle of the flying stars (Xuan Kong) system which is period 8 (2004 – 2024) and in May 2018, it has flown in to the southwest along with the annual #6 star which brings a lovely combination. It affects the hands, fingers, pancreas and back. It also affects wealth career and luck and because it is timely in period 8 (2004 – 2024) it is considered the most auspicious flying star. Once you activate this area it is a very strong wealth, success and romance area for the month so try and store your important financial papers here like pensions, stock portfolio etc. Sun 4 green Wen Qu romance and literacy star is a wood star. It affects the thighs, hip, buttock, bladder, liver and can cause colds and flu although on the whole it is considered an auspicious star and in May 2018, it has flown in to the west along with the inauspicious #2 star. Having a door in this area can bring in new opportunities although please be careful not to slam it as quiet and peace is needed in the west this year. Do not use fire or metal in this area or colours white, silver this month. Do not worry if you have these colours already just introduce colours blue or black in the way of a floor mat, cushions, tablecloth or such like. 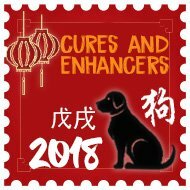 Chen 3 Jade is a wood star and a yang Trigram and has flown in to the northwest along with the annual #1 flying star and Tai Sui in May 2018 which means that the northwest will require care and attention this month. It affects the feet, lungs, convulsions, liver, bladder, limbs and hysteria. It also affects the eldest son and overall very inauspicious and needs cures or avoidance this month in this area otherwise it can cause many problems. Kun 2 Black (Ju Men) is an earth star and a yin Trigram and in May 2018, it has flown in to the centre along with the annual #9 star. It affects the stomach, digestive, general sickness and problems with thought process. It also affects the Matriarch (eldest female) and overall very inauspicious and needs either cures or avoidance this month in this area otherwise it can cause many problems.